If you have money in the stock market, relax. Drink your favorite tea or coffee, walk the dog, do yoga, focus on work or the kids again. This is not the moment to dump your stocks. Human nature is our worst enemy when it comes to investing. We see that sea of red on the TV and we naturally want to run. It's the same instinct we have when there's a fire. Consider this: The S&P 500 index -- what most people refer to when they talk about "the stock market" -- gained 220% in the past six years. Anyone who has had some money in the stock market in recent years should take a victory lap. It's been a very smart move. The so-called "plunge" we're experiencing right now is really a little shave. Even after all this turmoil, the S&P 500 is only down about 10% from its all-time high that it hit at the end of May. It's enough to be classified as a correction -- but barely. 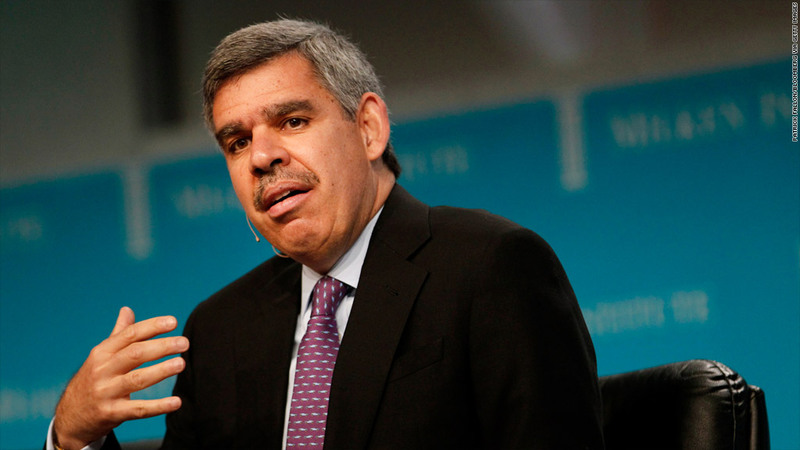 "Longer term, this correction will be a good thing," noted investor Mohamed El-Erian of Allianz told CNN today. "Do not panic at this point. It's better just to sit back and let this play out and then look for attractive opportunities." 1. Is the world really coming to an end? The only reason to pull your money out of the market is because you honestly believe we're on the cusp of a Great Global Depression that we won't be able to climb out of for years. There just isn't much evidence of that. The world's two biggest economies -- the U.S. and China -- are still growing. China has problems, but the debate is whether it's growing at 7% like the government says or 2% to 5% like many experts now think. Either way, it's still expanding. It just isn't as strong as it once was. Meanwhile, the United States is actually doing pretty well with a "good but not great" growth. The U.S. economy is expanding at about 2% this year and more and more Americans have jobs. Unemployment is at its lowest level since before the recession. There are definitely problems in many countries around the world (e.g. Venezuela and Brazil), but even if there is a global slowdown, the U.S. and China are coming into it from positions of relative strength. 2. Am I really going to bet against history? 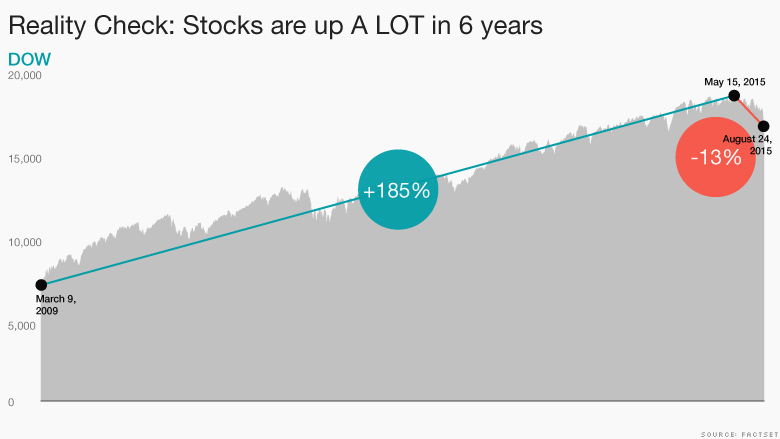 Stocks are the best way for regular people to grow their money over time. Since the 1920s, stocks have averaged about 9.5% returns a year and bonds have averaged about 5% returns. If you look at the past decade only, stocks have averaged about 7.5% returns while U.S. bonds have given investors under 5%. That doesn't mean that every year is a great year for investors, but it does mean that over time, sticking with stocks grows your money the most. "Volatility happens. A couple of percent is not a big deal. The market will correct by 10% almost any time. Over the course of history, it shows up as really nothing more than noise. "," says Jurrien Timmer, director of Global Macro for Fidelity. Those who stayed invested during the financial crisis, for example, recovered faster and are doing far better than those who dropped out of the stock market in 2008 and 2009, according to Fidelity. 3. Can I time the markets right? If you take your money out of stocks, you have to believe that you are such a good market timer that you are going to get out and get back into stocks at just the right time. You have to get BOTH decisions right. Otherwise, you might miss out on some losses, but you'll also miss out on some gains. That will cost you over time. "The worst time to decide to get out of the stock market is when it's falling or right after a big drop," says Kate Warne, an investment strategist at Edward Jones. "If you look at the days with the best market performance, a lot of them follow days with the worst market performance." There's a reason an 18th century British baron said "The time to buy is when there's blood in the streets," and people still use that phrase today. It's likely to be a rough few days...maybe even a rough few months for investors. But unless you need cash very soon and can't afford to take any losses, stay invested and stay optimistic. History shows markets go up over time.